Discussion: The talk today meanders from the different entertainment sources people turn to for solace and comfort in tougher times, to different methods smaller publishers use to keep costs manageable (making them more flexible in tougher times), and more. Interview: Evil Ways, the second book in the Morris/Chastain Investigations series is out, and Justin Gustainis joins us to talk about where the characters have gone since the first book, and a few things he has planned for them in future books. We also touch on the fact that Quincey Morris, the main protagonist, doesn't have any supernatural powers, and how readers have responded positively to that different take on the urban fantasy setting. The third book in the series, Sympathy for the Devil, is due out in December 2009. Just through the discussion so far. Good talk! One of the hardest things for me when I bought my Sony Reader was coming to grips with the fact that I didn't have a physical book in my hand. Now, I'm a hack of an author, but working on it (Mike, your 21 days to a novel is NEAT) , and I have a Kindle 2 on the way due to a nice tax refund. The TRICK is to separate content from media. Once I figured out that the important thing in a book are the words.. and the words are present in both paperback and electronic form.. I was hooked. I've read more now than I ever did, and plus, it opens you up to a whole bevy of websites and web fiction and what not. Once you judge things on the content, and not the method it was delivered to you, so many doors open. I look forward to being an author in this new media world. Hey can anyone tell me who carries the ebook version of Justin Gustainis's books? @Jarrod - you're exactly right, separate the CONTENT from the MEDIA. As they've been saying on DragonPage, a book is just a container for a story. A story in a paper box is the same story in a Sony Reader. I've got an eBook novella coming out soon (check my blog if you like steampunk! ), and meanwhile I have friends complaining about different sized print books in bookstores (mass market paperback versus trade paperback, etc, etc). Guys, like that matters! Enjoy the story! Anyway interesting interview with Justin in this show. Curious that he talks about a possible collapse of urban fantasy, and then talks about writing a second urban fantasy series which, to be honest, sounds pretty much the same as the first. Be interesting to see if he manages to keep the two separate. I've known authors who can write different series at the same time - like hard SF and high fantasy, sometimes writing under two different names - but switching between genres makes it easier. Two modern urban fantasy ranges? Hmm, good luck! See, to me? Sometimes the guys sound like they're trying to convince themselves about how eReaders are going to take over the market. And I don't have anything against them. I think eReaders are great. You can do a lot with them and I'm sure their use is going to continue to grow. In fact I don't understand why every school hasn't started issuing them instead of making kids carry around 25 lbs of books. But for one media to replace another, it has to be clearly superior. Like DVDs were just superior to VHS tapes in every way. But books are so clearly, fundamentally basic that I think they're going to be around for a long long time. In my mind it's sort of like the kitchen knife vs the food processor. There's no question that as far as technology goes there's no beating a food processor. And a lot of people have them. But the basic design of a kitchen knife hasn't changed in centuries and you'd be hard pressed to find a kitchen without one. Because the design is so basic and fundamental to what it's used for that it's hard to beat. It's the same with books. I can spend 6 or 7 bucks and stick a paperback in my back pocket and I'm good for a week or two. You can add all the bells and whistles you want but it's hard to improve on that. Oh sure, eBooks will never take over the world, or if they do it will be long after we're all dead in a format we can't imagine right now. But there is no reason why eBooks and eBook readers can't become a sizeable percentage of the market. If you could walk into any regular bookstore and either buy a book off the shelf, or buy an eBook version (eg, eBooks available for EVERY title), then that would be great customer choice, and I think sales of both traditional and electronic formats would do well. You are absolutely right in that people love books and therefore books will never go away. But in a mixed market the point is that you should be able to get eBooks for a lot less than paper books, and at the same time the author gets more money. So mix eBooks with regular books, and it's very exciting. Not only that, high quality, entertaining and thought-provoking books that either don't fit a neat genre, or that a big publishing house might think has no market, can be released with very low risk, as eBook production and distribution costs an infinately small fraction of what it costs to manufacture a print run of paper novels. All sounds good to me! 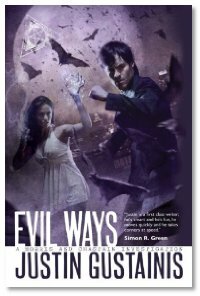 The mention of a small crossover with the Dresden Series was enough to make me grab a copy of Evil Ways. I'm not a rabid fan of Butcher (just read the first 2 Dresden books) but I REALLY like the concept of books by different authors intersecting in small ways.